All the colors shown are 2 coats. They all have a satiny finish. I bought these Maybelline matte shades last year at a Dollar Tree, I don't even like matte nail polish but I guess I couldn't resist the lure of $1 bottles! Matte Olive is an olive green and has a nice golden shimmer to it. I did manage to wear this for a day before it came off. Matte Grape is kind of a muted purple with a little shimmer. I had to see what it looked like with China Glaze Glacier over it. Not bad! Matte Sapphire is a dark navy blue with tiny silver glitter pieces. I'm probably alone here but I hated this one! This explains why when I was at Sallys I actually kept going back and forth taking Matte Magic out of the little tub and putting it back a few times lol. I put a coat of Seche Vite over this and now I like it! I don't know why I dislike mattes on me, it almost feels like I have dirty fingernails or something. It just irritates me. Oh well, I might go back for that matte topcoat so I can make fun designs with it if anything. I was lured in to getting these too last year at the Dollar Tree. I know I have the green and purple one and I think another one but I didn't see the sapphire one. 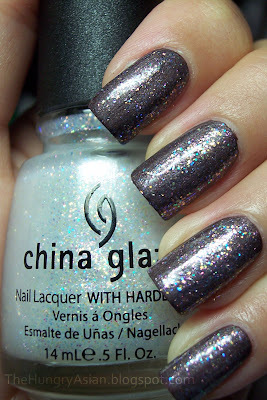 I agree, it is a bit strange to have a matte with sparse glitter. I do like it with the top coat though. Wow, Maybelline! Really? I would've never expected that from them. These are gorgeous. Especially loving the Sapphire w/the top coat. I remember when these came out and I desperately waned them but never got them. These are super snazzy. Doubt my Dollar Tree ever had them though. Boo. That olive one is really pretty! I never knew Maybelline sells matte nail polishes!! And for a dollar? Lucky. I am with you there Kae regarding Matte nails; not a huge fan myself! I agree that it can make a nail interesting at times however, I always get nails down the blackboard feeling when I look at Matte nails for some reason! Weird I know! The Matte Sapphire with the Seche Vite is my favourite pic today <3 That looks gorgeous! Love the olive green matte. The best thing about matte polishes are that you can always change the finish. For a dollar you can have tons of different looks. I love all the shades but that green is my favorite. It's also my favorite eye makeup shade.